ACTHA Offers Bold Guarantee: "Use It or Don't Lose It"
With the proliferation of ACTHA events nationwide, the American Competitive Trail Horse Association is showing their members some love and confidence. "It's a pretty simple guarantee," says Robin Tilghman, Director of National Sales. "ANY MEMBER OF ACTHA, NEW OR OLD, THAT IS NOT ABLE TO ATTEND AT LEAST 2 EVENTS DURING THEIR MEMBERSHIP YEAR CAN GET THEIR MEMBERSHIP RENEWED AT NO CHARGE." It doesn't matter what the reason is. ACTHA realizes things happen: Horses get sick, people get sick, weather is unpredictable and any number of events can happen that can keep a member from participating as often as they’d like." "It's the right thing to do and I think it exemplifies the dedication of ACTHA to our loyal members, current and future," states Ann Kinsey, ACTHA's new Director of Operations. "Putting our members needs first we know will pay off down the road". After having more than 1,000 rides, ACTHA prepares for its fifth year of offering Competitive Trail Challenges throughout the USA. The team is confident the next 12 months will bring more rides to more places than ever before. They bolster this statement with signed agreements with the Unwanted Horse Coalition and Horses 4 Heroes. Together these two organizations have over a thousand registered rescues and locations hoping for an ACTHA event to help them with their fiscal needs. According to Ms. Kinsey, "We most likely will not be able to accommodate all of them over the next 12 months but we're sure going to help as many as we can. These new locations, along with our historical growth from repeat and new rides virtually assure that all ACTHA members will find numerous opportunities to participate throughout the year. But if they can’t make at least two rides, they can get a free renewal. Pretty straight forward." "It’s going to be a record year for the horses we serve, our riders, our hosts and our dozens of sponsors, of that you can be sure, "says Carrie Scrima, ACTHA Co-Founder. Feel free to call regarding no cash sponsorship opportunities. The American Competitive Trail Horse Association is based near Austin Texas and for 5 years have been following the below mission. To create a registry open to all breeds and a point designation system which will stay with each horse for its lifetime, thereby adding to their value and distinction. To create and enable humane treatment options and employment for horses in need. March 28 update from Dave: I’ve made it through my surgery ok and I am on the trail to recovery. I have had one issue with my left arm so far. It has gone numb a few times for about 15 minutes each time,and then it goes back to normal. The doctors don’t know for sure what is causing it yet. I’m doing cat scans and MRI’s for awhile to see how my head injury is progressing. So far everything is looking good. I’ve had no headaches since my surgery. I do have two new holes in my head (one of them was a bonus) from the surgery. They are both healing really good. Overall I am just taking it easy and trying to get my head to heal. I’ve only been able to see one of my horses so far since the accident as they are still at Jackie Beaupre’s. My favorite female Carolyn is riding Rushcreek Ok. She did the Rides of March on him recently and is keeping Ok at her place in Washoe Valley. My house is back to normal now thanks to my endurance rider electricians Pam Anderson and Joyce Stoffey and my friend Kenny Creech. They have got all of my electrical problems fixed now. My old endurance riding partner Bonnie Way came up to see me. It was great to see her again. I think I rode over 10,000 miles with Bonnie. She is known as the mean nurse from California. She is a really great lady and a Hosebag. We are planning to make a decision on the Cave Run Non-Motorized Trails Project in April or May this year. This is a later than what we had hoped, but we continue to move forward. Resource specialists have completed an analysis of the physical, biological, social, and economic effects of each of the alternatives that were presented in the Comment Period Report we released August 31, 2012. Currently, other agency partners are reviewing the environmental analysis. We expect these reviews to be completed in April. The Forest Supervisor will then make a final decision based on 1) the effects of project activities disclosed within the resource analyses; 2) which alternative best meets the project purpose and need; and 3) which alternative best addresses the issues raised during scoping and the comments received during the legal comment period. We will keep you informed of further progress and any changes that may occur. Please contact me with any questions at rriegle@fs.fed.us or at 989-724-9381. A Santa Barbara County, Calif., gelding has tested positive for non-neuropathogenic equine herpesvirus-1 (EHV-1), the California Department of Food and Agriculture (CDFA) reported March 25. Teddy Lancaster of Running Bear Endurance and Trail Riding Essentials is the latest entity to join as a sponsor for the 2013 Adequan® AERC National Championships to be held in Almo, Idaho on September 20-22. Teddy will supply 100 Rider Vet Cards for the event. Susan Garlinghouse DVM and Art King DVM are the newest members of the Veterinary staff, along with Head Veterinarian Michael Foss DVM and Robert Washington DVM. Check the website regularly for updates and news, trail videos, and google earth fly-overs. Entry fees and applications will be posted soon. The winter months bring out the couch potato in many of us. Libby Llop of Caledonia has found another way to put in serious seat time waiting for spring to arrive. This would involve flying to Colorado and then driving and riding more than 3,800 miles to compete two weekends in a row in endurance rides in Texas and California before returning to Fort Collins, Colo.
Llop has been an endurance rider for quite some time. She and her Arabian mare, Fly So Free, were recognized at this year’s American Endurance Ride Conference convention as a Decade Team for having completed at least one recognized 50-mile ride per year for 10 consecutive years. About 10 years ago, Llop accompanied her husband, Dr. Quentin Llop, when he took part in a short course on embryo transplants at Colorado State University in Fort Collins. Prior to the trip, Libby inquired in an online endurance riding group about anyone in that area that she might connect with to help pass the time while Quentin was in class. A bill aimed at facilitating the establishment of the horse processing industry in Oklahoma is another step closer to becoming law after being passed by members of that state’s Senate committee on Agriculture and Rural Development. Laramie endurance rider Bonnie Swiatek will be spending a lot of hours on horseback this summer. Swiatek and Sky, her horse, will ride hundreds of miles together in endurance rides around the West. At 16, Sky is hitting her peak year for endurance riding, and Swiatek hopes to take advantage. “This is her year. I’m pretty excited about that,” Swiatek said. 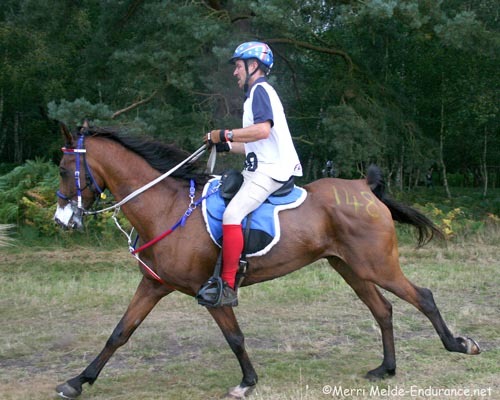 Endurance riding is an equestrian sport in which horse and rider compete in distances of up to 100 miles at a time. The winner crosses the line first while the horse must pass periodic veterinary checks to ensure its health and fitness. Riders must manage themselves, their horse, the weather and the trail, Swiatek said. “Every ride is a little different. You can’t just bull your way through. If you ride fast and go fast all the time, your horse will break down,” she said. Swiatek, 68, competes in a division called limited distance, where rides are 25-35 miles a day, with some events lasting several days. “We’re like an old married couple,” Cathy said as she cruised down the trail on Galen. Maybe its not quite like a typical human marriage – they’ve been together since his birth, and Cathy orchestrated the cross that produced him, but there are some similarities. Back in 2000 when Galen was a beautiful, gleaming foal who everyone wanted because of his color, he also demonstrated his strong will. Cathy often found herself talking people out of buying him instead of trying to sell him. He was not going to be an easy horse for an inexperienced handler. As he matured, Galen kept his strong will, but with a careful, consistent foundation, somehow Galen’s “one true way” was also Cathy’s way most of the time. Fillmore County resident Barry Saylor is a horse endurance rider. Horses, is what he does. “It’s all I do. I don’t do tennis or play golf. I do horses,” Saylor said. Paddy is 11-years-old and Mini is 10-years-old. They’re Arabians and according to Saylor, both are at their peak for endurance riding. OROVILLE – Oroville’s Heidi Hylton has been competing for two years in horse endurance riding and for a relative newcomer has racked up some impressive results. “I got into it indirectly through Kim Black, but more directly through John Newton, who is our farrier,” said Hylton. Hylton says she has a lot to thank Newton for and that there are five endurance riders in Okanogan County and they all use his horseshoeing services. “The sport is super hard on horses, if your horse doesn’t have a good footing under you, you can’t compete,” Hylton said. The competitor says endurance riding takes lots of time conditioning your horse and riding at least three times a week, five to 25 miles, to practice. Hylton and her husband Tony have nine horses on 40 acres outside of Oroville. Her husband also competed for the first time last year. He rides a full brother to her horse. “As a stallion he can be more difficult to deal with,” she said. Last year marked the 50th anniversary of the importation to the U.S. of the first get of Nazeer. The importer was Richard Pritzlaff, an intensely passionate man who loved the Arabian horse and understood the merits of all its best qualities. Richard was consumed by all things interesting and beautiful. His collection of art was second to none. He lived on a magnificent sprawling ranch in the New Mexico high country below Hermit’s Peak, called Rancho San Ignacio that he had owned since the mid 1930s. After a riding accident on a Paint horse, he decided he needed a more agile and durable mount and had been impressed by the Arabians he had seen. In a simple twist of fate he became acquainted with Carl Raswan and enjoyed riding in the countryside on some of Raswan’s Arabians. Raswan had lived among the Bedouin tribes, as well as in Egypt. He had traveled globally and had selected horses for important breeders in the U.S. Europe and Poland. Raswan was known for his excellent eye for a horse as well as his vast knowledge of the history of the Arabian. He was an exceptional resource for helping Richard choose his first Arabian horse. Richard had first obtained a riding horse from Raswan, the Arabian stallion Muntez which was used to produce AngloArabians. Equine herpesvirus-1 (EHV-1) is a highly contagious disease that affects horses and camelids and is commonly referred to as rhinopneumonitis or “rhino” in its respiratory form. EHV-1 is passed horse to horse via aerosol transmission (when affected animals sneeze or cough) and contact with nasal secretions. The virus can cause epidemic abortion in mares, the birth of nonviable foals, or a sporadic neurologic form of the disease called equine herpesvirus myeloencephalopathy (EHM). The Horse’s official 2013 EHV-1 Tracker offers the most up-to-date and accurate information about reported EHV-1 cases throughout the United States and Canada. Breed Awards were announced at the March 8-9 AERC Convention in Reno, Nevada. Will Moncrief trotted into the jumping arena Sunday, flashing a smile as he waved the American flag while riding atop Pretty Boy — his grandfather’s cracker horse. His presence was a part of the Red Hills Horse Trials parade of breeds. Moncrief and his family stem from a long history of celebrating the state’s official horse, which was a part of Ponce de Leon’s initial visit to the New World in the 1500s. Moncrief was thrilled to showcase a breed that has a special place in his family, not to mention a sweeping hand in the driving cattle industry and the settlement of Florida. The parade featured nine other horse breeds, but Moncrief was flanked by two other cracker horses: Sweet Bill and Sally Too ridden by Amanda Carpenter and Celina Murray, respectively. The 2013 AERC Convention concluded Saturday evening with a year-end awards banquet. 2012 Hall of Fame Horse is Granite Chief +/ owned by Karen Chaton. 2012 Hall of Fame Person is Maike Maul. 2012 Pard'ners Award went to Mike Maul and Rroco-My-Sol. California, United States, March 8, 2013 – Jeremy Reynolds, ranked 14th in the FEI Open Riders World Endurance Ranking leads the United States riders with two horses owned by Reynolds Racing. Jeremy’s mounts are two geldings, 7 year old RR An Honest Crook, and the 8 year old gelding Chanses. Jeremy represented the USA at the World Championships in Great Britain, where he finished in 21nd position. Cheryl Van Dusen rode in the Pam Am Games 2011 held in Santo Domingo, Chile. Cheryl is currently ranked 19th overall internationally riding her two geldings EBC Regal Majjaan and Nazeefs Pinot Noir. Marcia Hefker, a new comer to International competition, entering her second season in FEI competition. Marcia started out with a good showing this year winning the Ridgecrest 160 km on her 12 year old mare, Hindi Bint Samia. Ann S Hall rounds out the top twenty five ranked riders in the 24th spot riding the Hall’s HCC Zara RR. The 12 year old mare, was Ms. Hall’s partner with to win the FEI World Champion Horse and Rider Combination title in 2010. While the top ranked riders in the FEI World Ranking reflect the endurance season of the Middle East in full swing, the United State is looking to continue their upward movement in International competition as their season is just starting. The United States through the support of the American Endurance Riding International Committee, United States Equestrian Federation and the private donation of the Rashid Fund has a record number of FEI sanctioned rides for 2013 . The United States has given un- prescient support to the Young Riders program. The Open Rider World Endurance ranking number one position is held by United Arab Emirate rider Al Abbar Mohammed Ahmed Hassan. Thus far in the season, Al Abbar has finished 3 of 4 events, including 11 place finish in the 160km HH Sh. Mohammed Bin Rashid Maktoum Endurance Cup, riding Castlebar Kadeen. Following closely in the second position is New Zealand rider Alison Higgins. The FEI, founded in 1921, is the international body governing equestrian sport recognized by the International Olympic Committee. Today, it is the sole controlling authority for 8 equestrian disciplines throughout the world. Of the equestrian disciplines that FEI oversees is the sport of endurance riding. Oakland, California – March 7, 2013. John Crandell III, the 2007 Chronicle of the Horse Overall Horseman of the Year and his famous horse Heraldic are household names in the sport of endurance. They were the first - and so far only - pair to earn the “Triple Crown” in the history of American endurance riding by winning the Virginia Old Dominion 100, The Western States Tevis Cup and the AERC National Championship in 2006. Still running strong with many national and international awards, Crandell and Heraldic won Tevis for the second time in 2010, won team and Individual silver medals at the Pan American Games in 2011 and represented the U.S. at the World Endurance Championships in England in 2012. Crandell has a lifetime of experience in the sport of endurance, and he approaches each element of training and gear selection analytically. When he began using ReactorPanel saddles in training rides, he learned firsthand of the system's benefits. When he started using ReactorPanel saddles, Crandell noticed the difference in his horses right away. “With ReactorPanel Saddles, you notice the extra freedom of motion that the horse has underneath you, which is tremendous” he said. “The horses are willing to become more supple in their backs. You might notice it first going downhill where typical saddles tend to put extra pressure into the shoulder blades. These saddles sit exactly where they are supposed to be with little or no tension or assistance from a crupper or breast collar. It particularly becomes apparent at the end of a long, long day of riding." With the amount of conditioning required to be competitive in the sport of endurance, horses’ backs change, develop and muscle up, sometimes going through multiple changes in a single season. Carmi Weininger, President of ReactorPanel Saddle Company, was understandably pleased to learn that Crandell was interested in helping to develop a new RP saddle. She said, "John was conditioning in our saddles but felt they were too heavy for racing competitively at the FEI level. During our first conversation in early 2012, he challenged me to make a lighter weight saddle. We got excited about the idea of providing the legendary RP fit in a lightweight package, and were able to design the first prototype in just a few months. John has been racing in our saddles since we delivered the first one in July, and has given us excellent feedback that has allowed us to improve the design." Crandell is thrilled with the lighter saddle he developed with the ReactorPanel Saddle Company. Finally, he feels he has the perfect saddle for competition for his body type. Crandell couldn’t be happier with his ReactorPanel experience. “Carmi has been wonderful. I've come to expect her to give objective advice. You can tell that she just enjoys considering everything openly. That really gives you confidence,” he said. The ReactorPanel "Heraldic" Endurance Saddle retains all of the fitting principles of the ReactorPanel system, including flexible panels on user-adjustable shock mounts using aviation grade velcro for almost infinite adjustability. This saddle is available now in a 12-lb version, with an even lighter saddle in the works. Pricing starts at $2500. The ReactorPanel Saddle Company, based in Oakland, CA, makes saddles for multiple disciplines including dressage, trail, endurance, eventing, hunter/jumper and fox hunting. Policies are as unique as the products. Saddles are not for sale until the rider has gone through a two-week evaluation, which is free (except for freight). Saddles are fit and adjusted by specially trained Fitting Agents, or by users who enjoy do-it-yourself projects and access the company's unlimited customer support, user's guide, and how-to YouTube videos. 3/7/13 This is for the rider who would like to be recognized for donating to the preservation and improvement of the Tevis trail. This $1,500 entry includes a buckle upon successful completion of the ride, a director's chair with the Tevis logo, jacket for the rider and a sheet for their horse with a one-of-a-kind patron of the trail emblem monogrammed on each item, an invitation to the VIP/Foreign Rider Reception on Tuesday night before the ride, reserved seating at the Sunday Banquet including additional recognition, a two-night stall reservation, Thursday and Saturday night assisted parking at Robie Park and Foresthill, a copy of "They Crossed The Mountains" DVD, and a CalStar Insurance Membership specifically covering the Tevis Cup. The Signature Rider entry includes a letter of donation for $800. Click HERE to fill out your entry! Nancy Salazar and Steady's Bad Boy logged 485 miles in 2012 to take the second annual High Mileage Standardbred Award, given by the USTA through the American Endurance Ride Conference. Based in Minnesota, Nancy and Steady's Bad Boy traveled to rides in their home state as well as Illinois, Michigan and Wisconsin. The AERC awards banquet and convention is being held in Reno, Nev., this Friday and Saturday (March 8-9). Salazar has already received her awards blanket as she will not be attending the ceremony, and the duo will be the subjects of the next ad in Endurance News, the AERC's membership magazine. Steady's Bad Boy is an 8-year-old gelding by Badlands Hanover that made $24,496 on the track and took a lifetime mark of 1:54.3 at Colonial Downs in 2010. His dam, Steady Ironstone (by On The Road Again), made more than $109,000 and his Pro Bono Best half-brother is the currently racing Road Storm, who is also a $100,000 earner. "This is Steady's Bad Boy's second year in long distance riding," said Salazar. "In addition to being a pacer, he now has acquired a long trot and a beautiful canter. What I love about him is he just does what you ask him to do, mile after mile. He remembers his racing days and uses a bit of that attitude when he needs to." Finishing second was the inaugural winner of the Standardbred Mileage Award, East Meets West and Patricia Clark; together they logged 280 miles of both Endurance and Limited Distance rides. The AERC High Mileage Standardbred award is given to the Standardbred that has the most miles ridden during the current riding season (Dec. 1 through Nov. 30). All rides are considered, including the limited distance 24-35 mile rides, and standard endurance rides (50-plus miles). Riders must be a member of AERC in order to track horse and rider mileage. For more information on the AERC, visit their website at www.aerc.org. Since 1996, the Standardbred Equine Program has worked with off-the-track Standardbreds and their owners to educate the general public about the many disciplines at which Standardbreds excel once they are retired from racing. For more information about the SEP at the USTA, visit standardbreds.ustrotting.com, or send e-mail inquiries to sep@ustrotting.com . A farm in Wellington, Fla., where a horse had tested positive for equine herpesvirus-1 (EHV-1) has been released from quarantine, according to a March 4 statement from the Florida Department of Agriculture and Consumer Services (FDACS). Meanwhile, the EHV-1 case count in Ocala, Fla., is holding steady at seven. In Wellington, noted the FDACS statement, Tequestrian Farm "was initially quarantined due a horse testing positive for EHV-1. This horse was imported from another state and isolated at the farm on arrival. No connection was made between this horse and the HITS Showground EHV-1 cases. The horse never developed neurologic signs and the quarantine was released after fourteen days with no evidence of transmission, no clinical signs on the farm, and all horses testing negative on the premises..."
Hello, Tevis enthusiasts. I hope your late winter training is going well. On behalf of the Tevis Ride Committee I would like to update you on the July 20, 2013 ride. I am excited to announce that the first 15 qualified juniors to submit a ride application with a qualified sponsor application for the 2013 Tevis will have their entry sponsored! Yes, our young riders can ride free of charge! If the junior is a first time finisher, he or she would also qualify for a legacy buckle! Juniors and sponsors take notice that this invitation is extended to the first 15 entries. The 16th junior to sign up does not qualify for the free entry. Tevis Board members and our generous sponsors are committed to the future of the sport of endurance riding. The Tevis ride takes a stand that encouraging junior riders and their adult sponsors to accept the ultimate challenge is just one of the ways the Board of Governors is leading the sport by supporting today's youth. If you would like to be a sponsor of one of our junior riders, let us know at the office. We would love to have you join in our mission. The Legacy Buckle program is returning for 2013. Legacy Buckles are buckles that were earned and owned by Tevis completers who have been donated the buckle back to the WSTF. They are then presented to first time finishers at no cost to the rider, thus fulfilling the legacy. This program was so well received that the committee has had to work hard to offer this generous program again in 2013. Riders hoping to take advantage of this program need to pray extra hard to the "Tevis gods" to finish this year as the supply of "Legacy Buckles" may run out in future years. In an effort to provide enriched opportunities for riders who would like to give back to the trails that mean so much to us, WSTF BOG announces the Signature Rider entry. For the rider who would like to be recognized for donating to the preservation and improvement of Tevis trail we offer the Signature Rider entry. This $1,500 entry which includes a buckle upon successful completion of the ride, a jacket for themselves and a sheet for their horse with a one-of-a-kind patron of the trail emblem monogrammed on both items, a Tevis Cup Director's chair, an invitation to the VIP/Foreign Rider Reception on Tuesday night, reserved seating at the Sunday Banquet with additional recognition, a two-night stall reservation, Thursday and Saturday night assisted parking at Robie Park and Foresthill, a copy of They Crossed The Mountains DVD, and a CalStar Insurance Membership specifically covering the Tevis Cup. The Signature Rider entry includes a letter of donation for $800. To insure the highest quality ride experience for all entrants the 2013 Tevis ride is limited to 210 entries plus ten foreign rider entries. Entry forms are available on the home page. TRADE SHOW EXHIBITORS: Confirmed and ready to greet convention attendees will be: Action Rider Tack, Adequan AERC National Championships, AERC International, Ameraican Trail Gear, Arabian Horse Association, Arabian Saddle Company, Auburn Laboratories Inc., Boz Saddlery, EasyCare Inc., Equithotics Inc., Equus Nutrition for Horses, Farmers Warehouse/LMF Feeds, Fleece Works, Hought Endurance Tack, Jans Jems, Just For "Horsin-Round", Ann Kratochvil, Lemke Saddle Services Inc., Natural Horse Halters, Porta-Grazer, Purina Animal Nutrition, Reactor Panel Saddle Co., Renegade Hoof Boots, Revitavet Therapy Systems, Snell Valley Ranch, Specialized Saddles, Triple Crown Nutrition, Western States Trail Foundation (Tevis), USEF, Wild Horses of Nevada Photography, Vettec. There is still time to sign up for the convention in Reno March 8 & 9, 2013. Two additional Cache County, Utah, horses have tested positive for equine herpesvirus-1 (EHV-1), bringing the total number of confirmed cases in that state to four, according to a Feb. 27 update from the Utah state veterinarian's office. "Tests on two of three horses that were under observation returned positive results on Wednesday at 11:00 a.m [MST]," the statement read. "One other horse remains under observation. It will be retested in the coming days. The number of confirmed or suspect cases remains at five..."